This guide and textbook on motorsport engineering is written from a practical point of view. It offers a wide-ranging insight into the nuts and bolts technology of practical car racing from saloons and sports cars to open wheelers. It gives the aspiring race engineer the tools to do the job by explaining all aspects of race car technology and offering crucial insight into the essentials of the motorsport engineering industry. 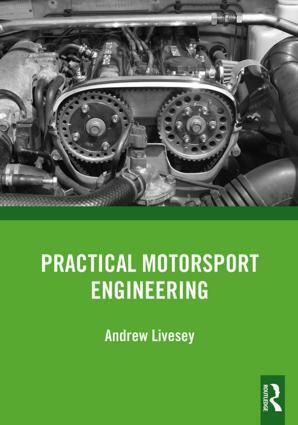 For motorsport engineering students at all levels, this book particularly covers the examination syllabuses for IMI (the Institute of the Motor Industry), EAL and BTEC, and meets the CPD requirements of most engineering institutions. Each aspect of the race car is covered in a separate chapter with test questions and suggestions for further study at the end. Combining the key points from his previous publications Basic Motorsport Engineering and Advanced Motorsport Engineering, the author draws on a career in teaching and industry to create the must-have, all-in-one reference. It is an ideal companion for the practising owner, driver or race engineer (whether amateur or professional), a suitable introductory text for HND and degree students and a great point of reference for any other keen fans with an interest in motorsport. Andrew Livesey has set up a Kart Engineering Academy at Buckmore Park Kart Circuit, is a member of the Institute of the Motor Industry and the Institution of Mechanical Engineers, and has been an examiner for degrees in both Motorsport Engineering and Automotive Engineering. He is former Head of Motorsport on the Oxford Brookes University Brooklands HND and degree programmes, has worked for McLaren F1 and super car production, and has run a company building race and rally cars. He was also technical editor of Cars and Car Conversions and Custom Car magazines. He teaches part-time and runs an independent consultancy in Kent.